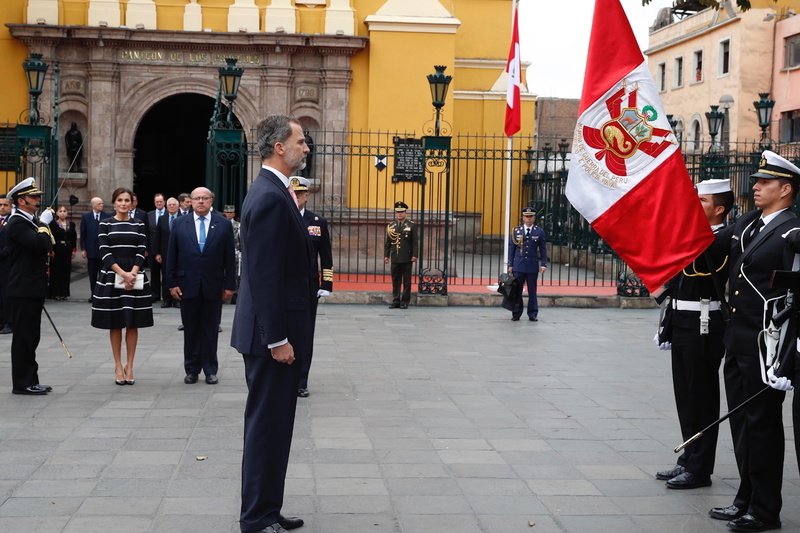 King Felipe and Queen Letizia of Spain arrived in Peru on Monday to start their 3 days state visit to the Republic. 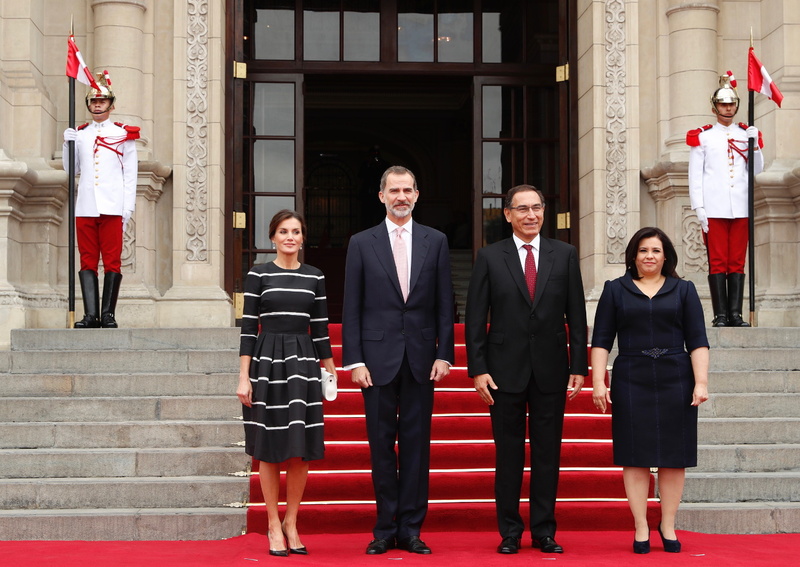 This is couple’s second visit to the Republic of Peru since getting married, last time they visited the country as 2008 as Prince and Princess of Asturias. The 3-days visit is scheduled to highlight and reinforce the historical ties and the bilateral relations between both countries. 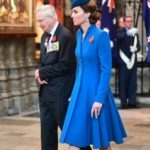 Upon arrival, the royal couple was received by the Minister of Defense. 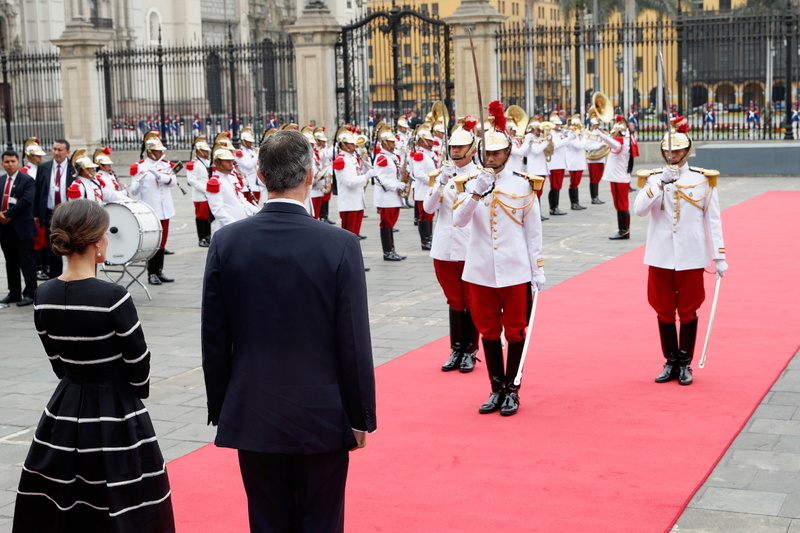 The first stop of the day was the Patriotic Sanctuary of Lima, where they received a military welcome. 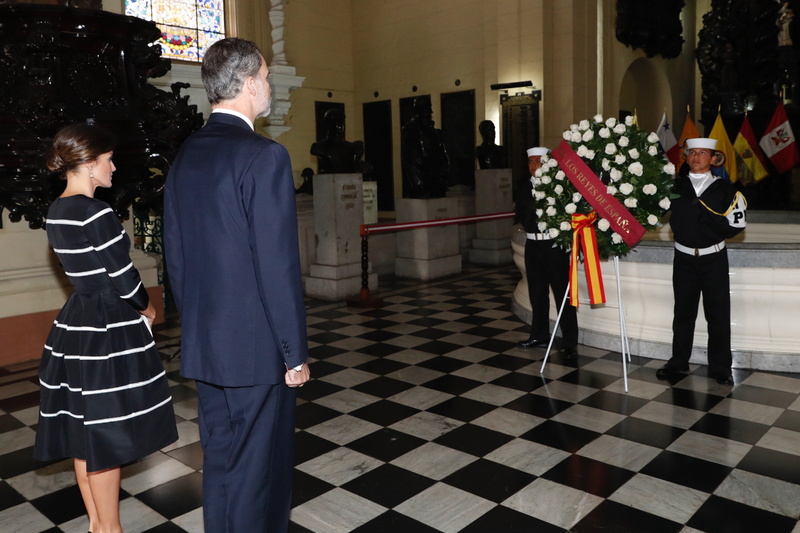 Felipe reviewed the troop and then laid a wreath on at the National Pantheon of Próceres to honour the fallen soldiers. 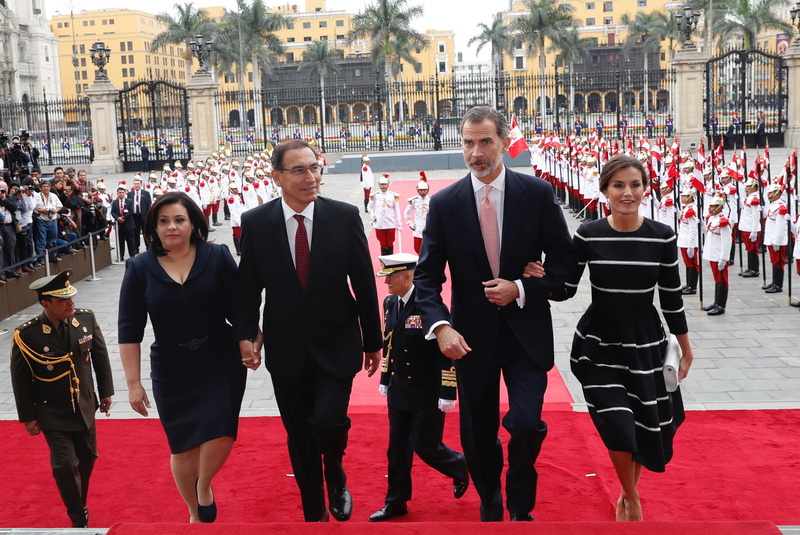 Next Felipe and Letizia headed towards the Government Palace, where they received the official welcome from the President and First Lady of Peru Martín Alberto Vizcarra and Maribel Carmen Díaz. 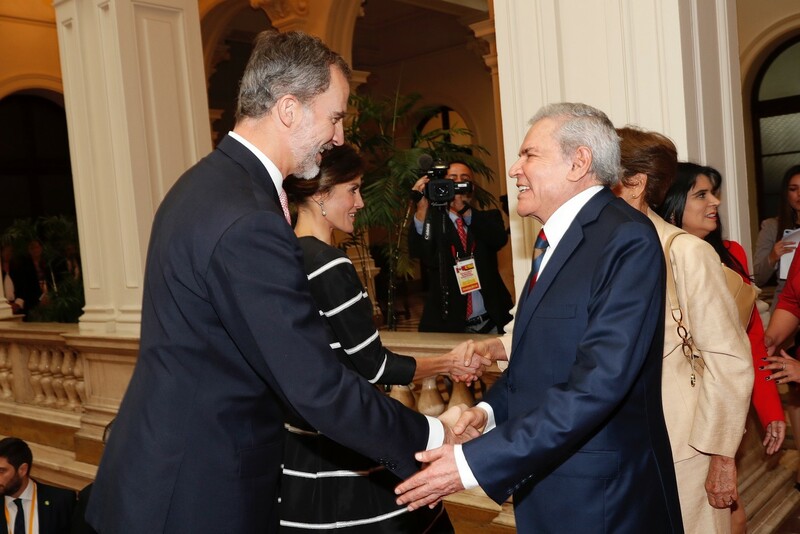 The Spanish King and Queen received a welcome of 21 Gun Fires. Before posing for the official photograph and moving inside, Felipe received the guard of honor and reviewed the troops. 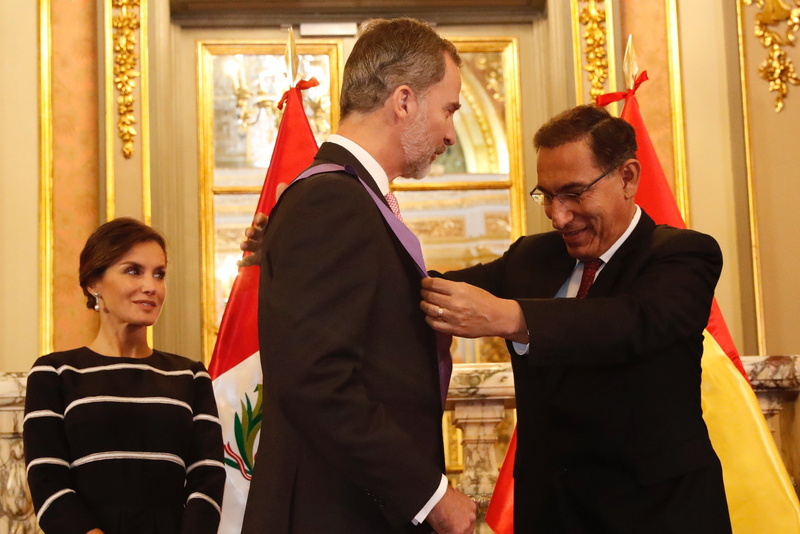 The President of Peru presented the King with the Grand Cross of the Order of Merit for Distinguished Services. Both the King and President gave formal speech before the delegation of both countries. 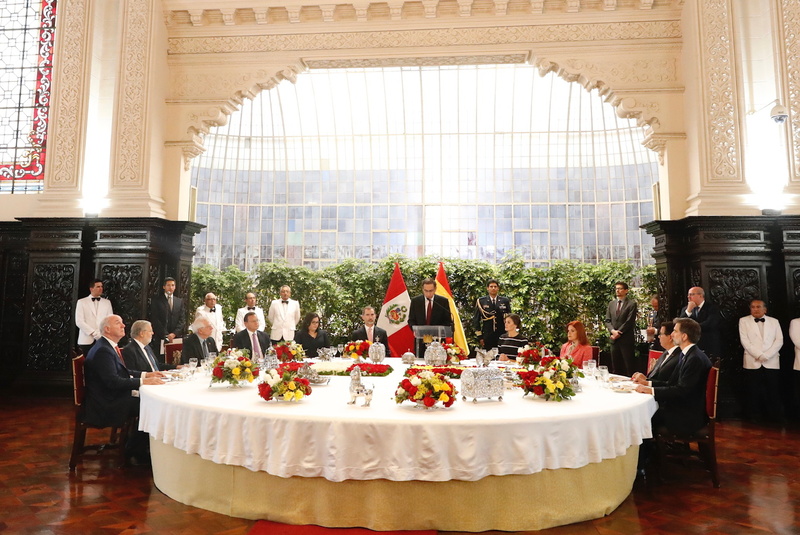 A lunch was hosted by the President and First Lady of the host nation. 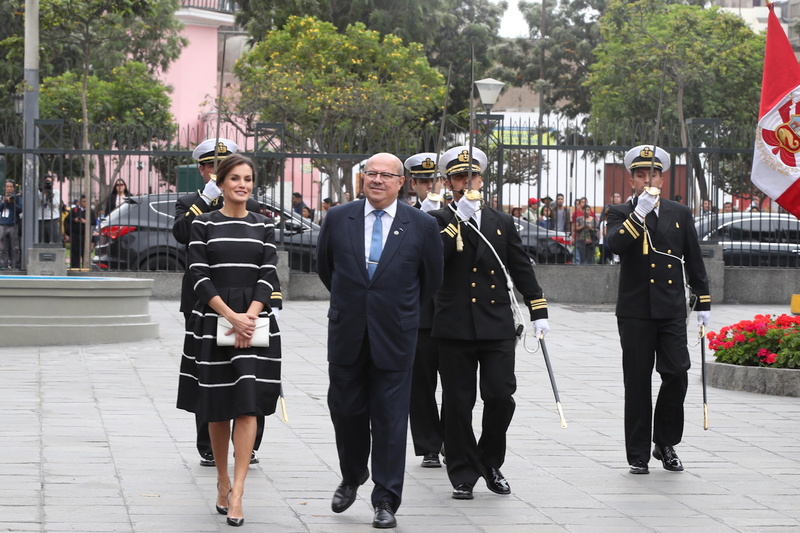 After lunch, Felipe and Letizia headed towards the Metropolitan Municipality of Lima. They were welcomed by the group of children from the Kingdom of Spain School. 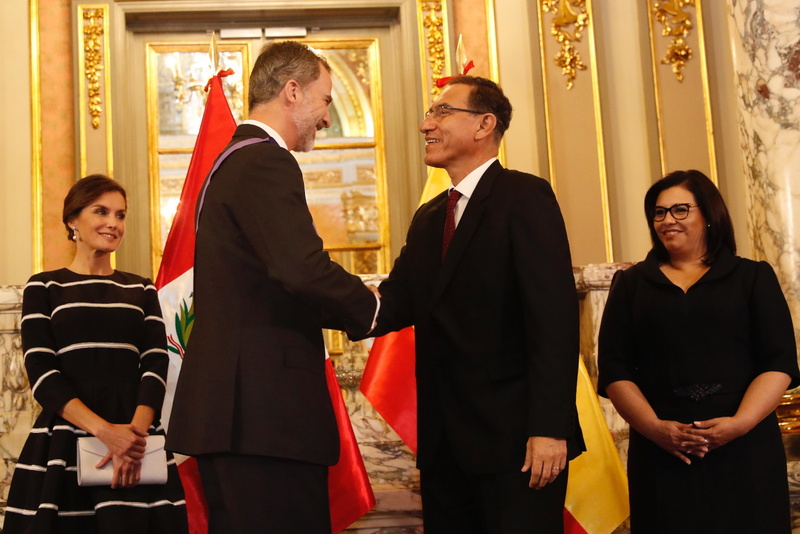 During thr visit to the Municipality, the metropolitan mayor of Lima, Luis Castañeda, handed over the Key to the City to King Felipe. The couple signed the golden book of the city. 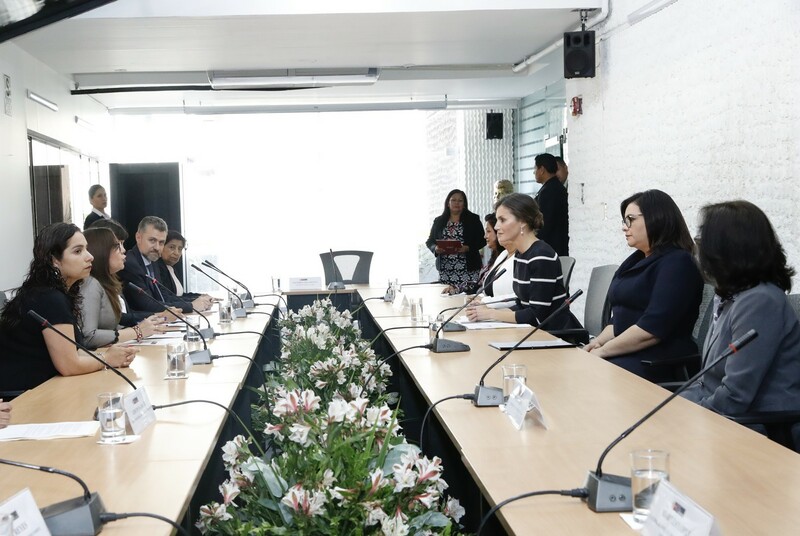 Speaking at the Municipality, Don Felipe stressed that “one of the great strengths of the excellent bilateral relationship that unites our two countries is the fact that it does not depend solely on the work of governments, but a dense web of relations in the that all the levels of the Administration and of the society involved”. 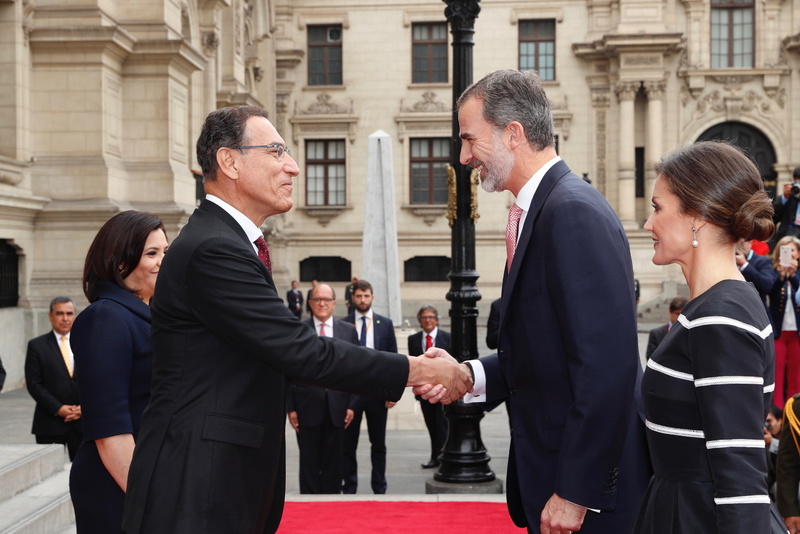 The royal couple was shown Historic Center that in 2021, coinciding with the Bicentennial, will celebrate the 30th anniversary of its declaration as patrimony of the Humanity and that has been the scene of the cooperation between Spain and Peru. 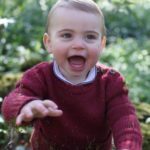 Next both Felipe and Letizia had separate engagements. 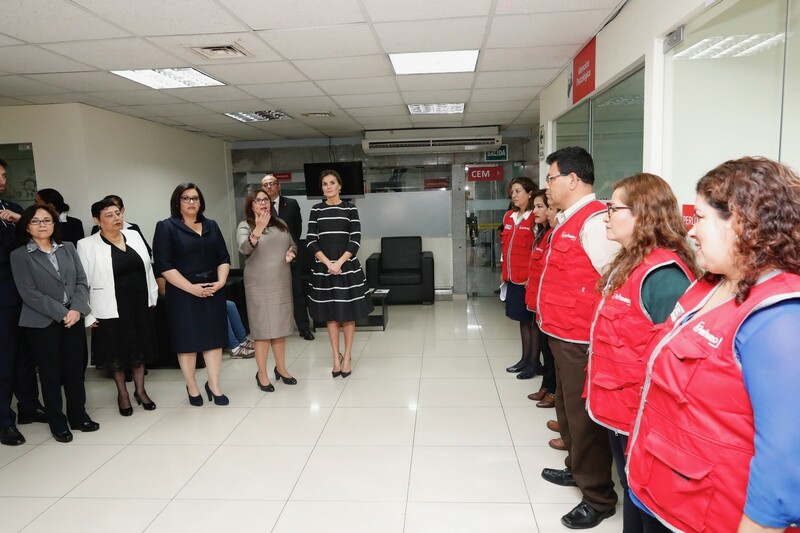 Felipe visited the Congress of the Republic of Peru, where he met with the President and members of the Congress while Letizia accompanied by the First Lady visited the Emergency Center Woman in the Ministry of Women and Vulnerable Populations. 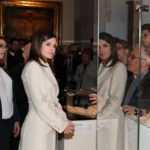 Letizia toured the center and held a brief meeting with the administration and volunteers. 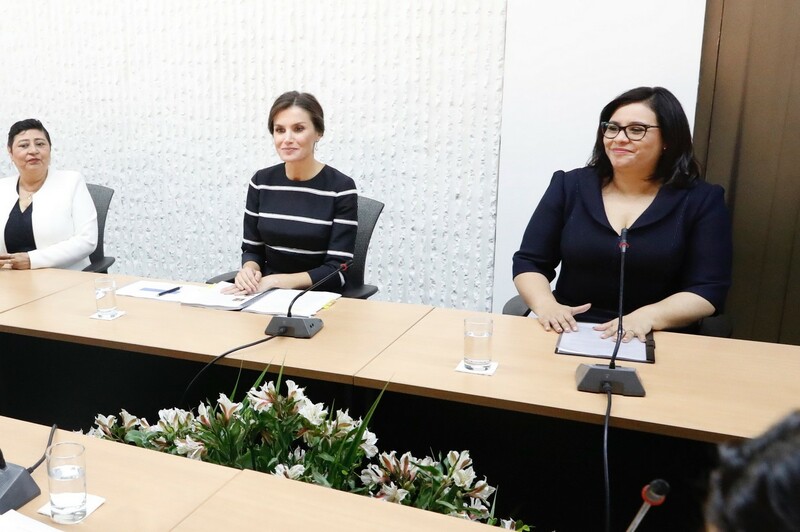 She also saw the support of cooperation Spanish Federation to fight against gender violence in this country, an objective to which Spain will allocate 1.5 million euros for the next two years. 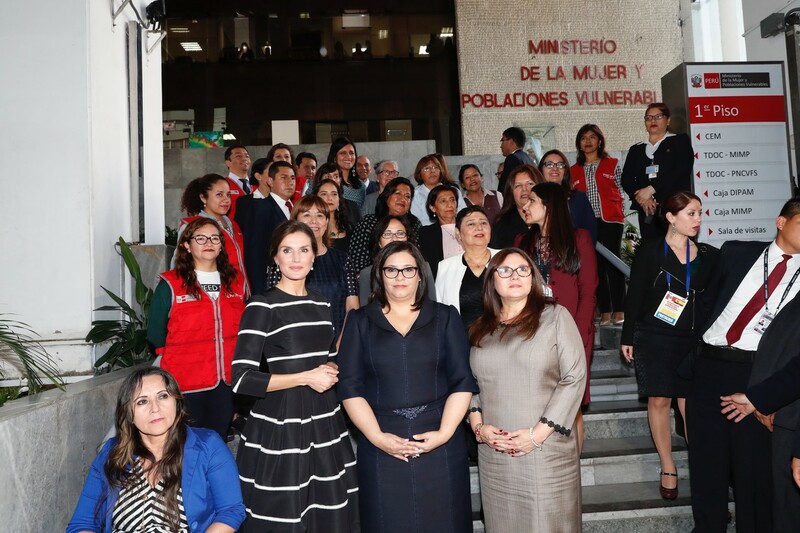 This center is part of a network of 637 offices dedicated to the care of victims of gender violence and support to police and judicial authorities in the prosecution of gender crimes and in the family. 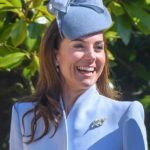 For the first day of the tour, Queen Letizia chose a very simple yet stylish look from her trusted label Carolina Herrera. She wore Crochet-trimmed pleated silk-faille dress featuring horizontal contrasting white crocheted trimson it. 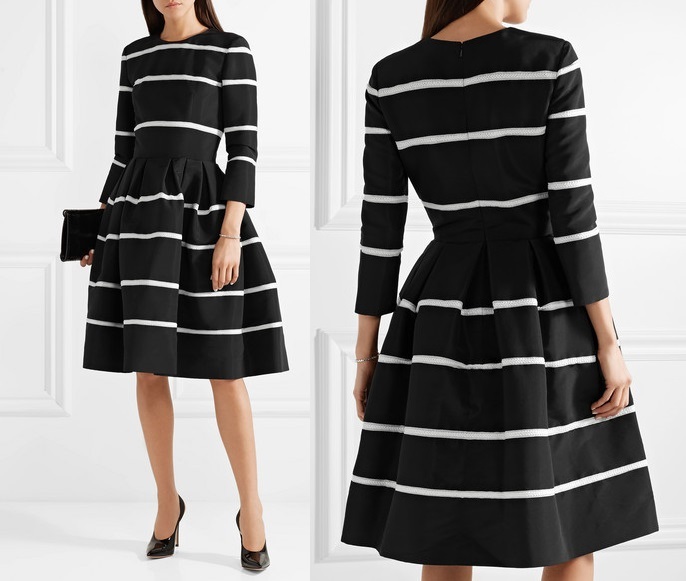 The $2990 dress featured a round neckline and three quarter sleeves. The highlight of the silk-faille dress was its pleated full wide skirt that fave the illusion of ball gown. 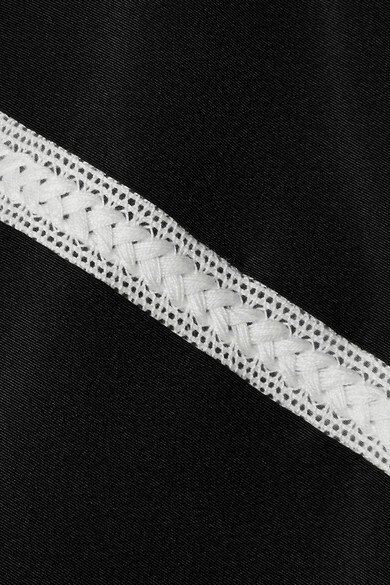 A closer look at the crocheted trimson on the dress. 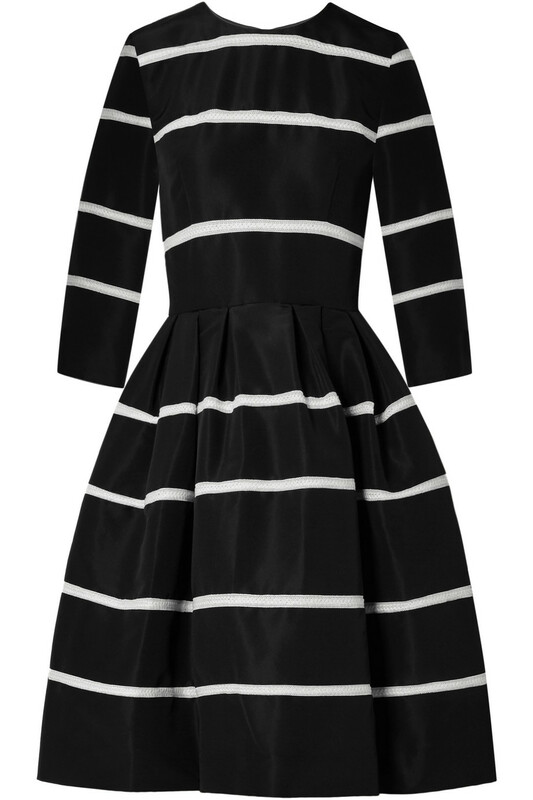 The dress is still available on Net-A-Porter and Neiman Marcus. 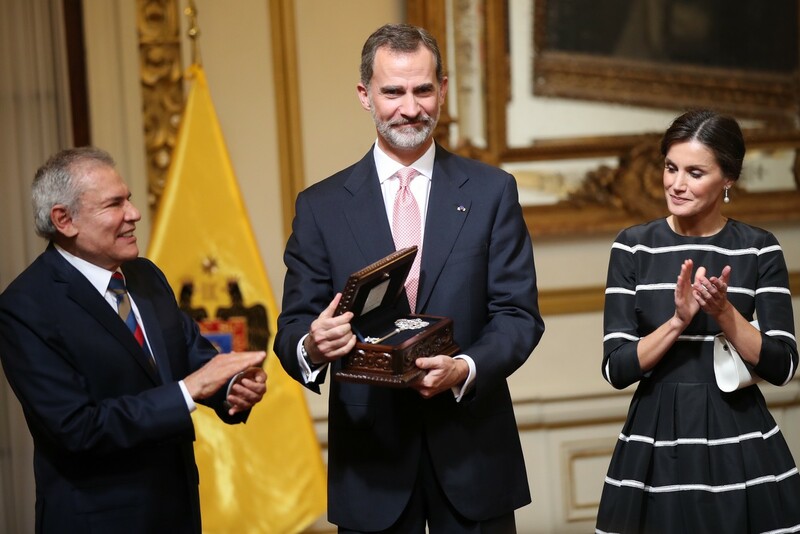 Letizia paired the dress with Magrit Vinayl pumps that that she premiered when the Royal Couple welcomed Columbian President and First Lady to the Royal Palace in May this year. 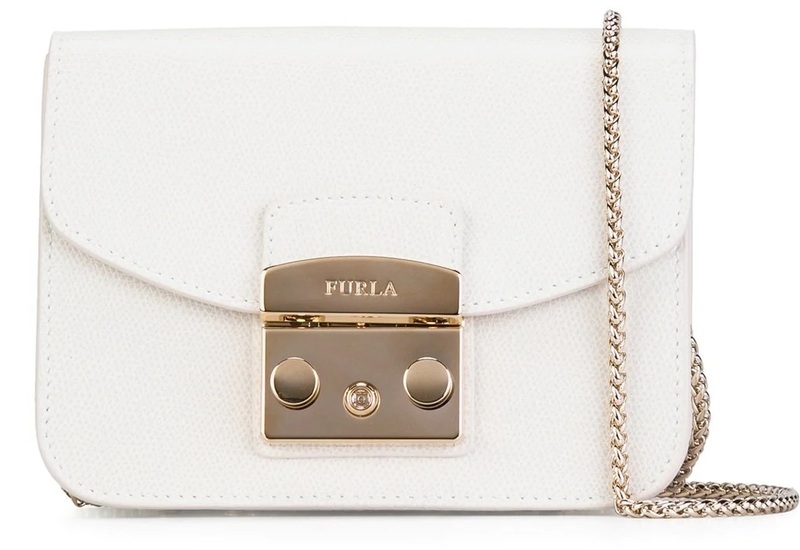 She was carrying a Furla Metropolis mini cross body bag, a new addition to her extensive wardrobe. The petite size of the $256 bag adds a stylish delicacy to the design which features a fold over top with clasp closure, gold-tone hardware and a chain shoulder strap. The bag is also available in black, pink, red and many other colours. 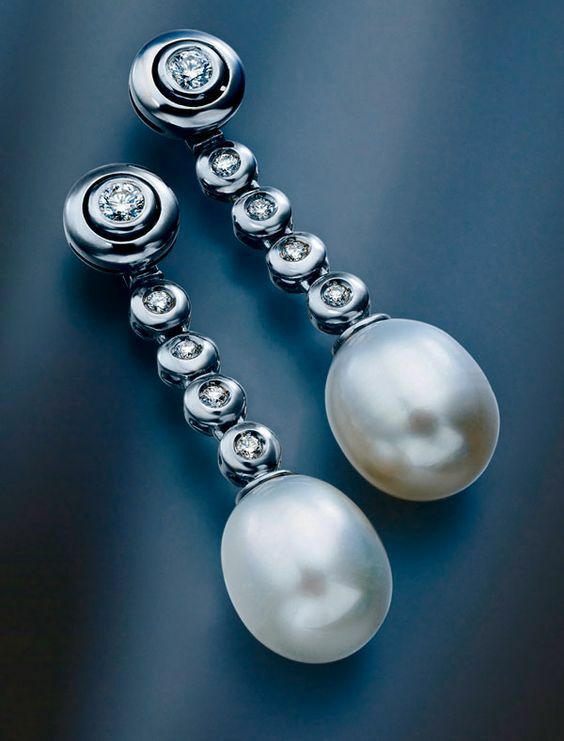 Her Australian peal and diamond earrings finished the look of the day. 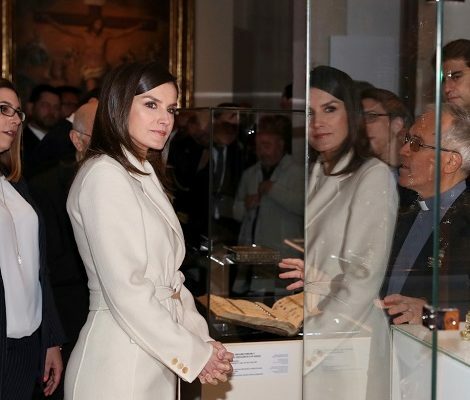 A look at Letizia’s Outfit of the day. Tomorrow Letizia and Felipe will start the second day that is again full of different engagements.